They say a celebrity endorsement can work wonders!!! Well here's a lovely famous guy (who you may know from 'The Office' or 'Pirates of the Caribbean') taking a flick through my 'Angel Delights' the other day. He said he thought it was 'Great!' and had spotted me drawing new angels before. 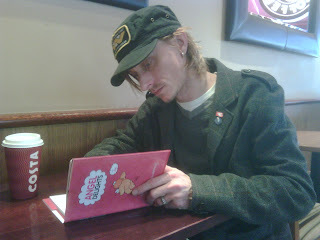 Then took a copy home to show the kids and join his collection of funny books .... cool. Hi Guys ... here's another dear little guardian angel to share with you today... loads more to follow in coming months. Love to hear your feedback. Also working on creating an iPhone app of the angels.